Whether you’ve taken the leap or are just thinking about it, raising chickens is a great way to become more self-sufficient. Chickens are a wonderful introductory livestock animal, and can provide you with an ongoing supply of eggs or meat. 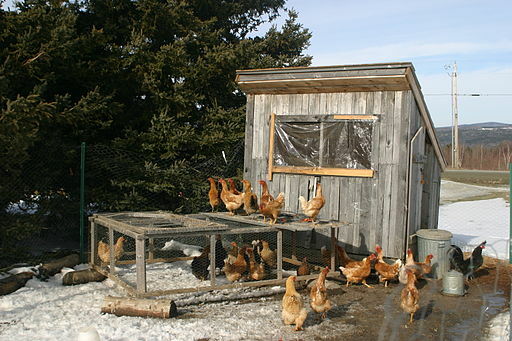 But raising chickens, especially in colder areas, comes with the responsibility of properly caring for those animals. Hopefully if you’re new to raising chickens, then by the time winter rolls around your birds will be more than just little chicks. If you got chicks late in the year, then you may want to keep them inside at night until their full feathers come in. There are four main areas you will need to focus on to prepare your flock for the winter: Shelter, food, water, and physical care of your birds. 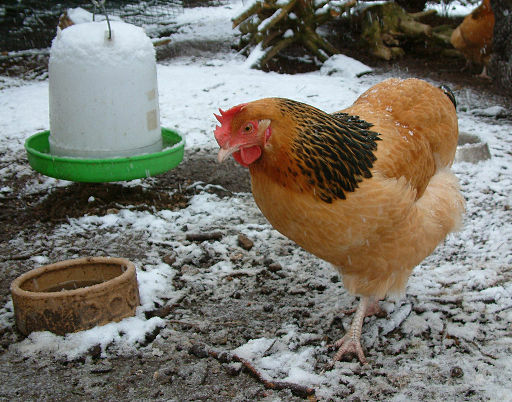 Some breeds of chickens are more cold hardy than others, with smaller combs or longer, thicker feathers. Other breeds, unfortunately some of the most common, are not suited to the cold weather. Chickens have a layer of down under their feathers and this plus huddling with flock mates can greatly increase their tolerance for cold. But the first and foremost action you need to take is to provide your birds with a good shelter. Your flock, whether you have two birds or twenty, will need a solid shelter to survive and thrive through the long, cold winter. Providing them not only with nesting boxes and security from predators, the coop is also their home. That’s the place they feel safe, the place they run to when an eagle or hawk flies overhead. The coop can present some problems of its own though. You want it to be as wind-proof as possible, while still allowing for some circulation of air. If the coop is locked up tight all the time, then you will encourage the growth of pests and mites. Make sure you have an offset vent so that the air can circulate while preventing any direct breeze from blowing into the coop. If you leave the coop door open all day so that the chickens have access to come and go, that’s probably enough venting each day. Get some extra hay or straw or a bale of pine shavings to line the floor of the coop with as well. This will provide a couple extra inches of insulation on the bottom, while keeping the chicken’s sensitive feet well off of the floor. You can also add a heat lamp for those brutally cold nights, but be careful with a heat lamp. Coop fires are not unheard of in the northern parts of the United States, especially with all the dry shavings, straw and feathers. Make sure your heat lamp is located well away from the perches or nesting boxes, and that it is not too close to any of the walls, ceiling, or floor. Plug it into a GFCI outlet in your house for added safety, and tape up all outlet connections if they’re outside. 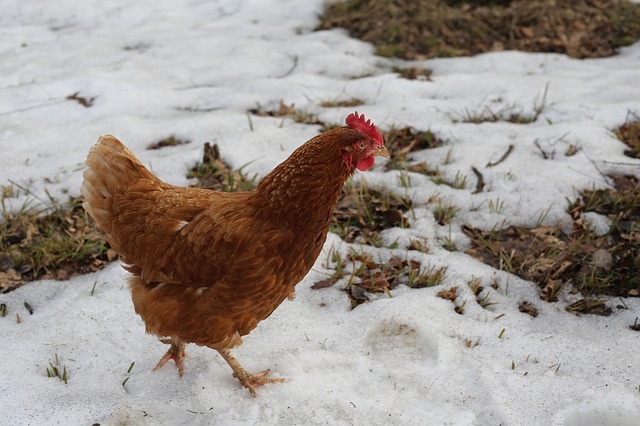 Just like any other animal that doesn’t hibernate, chickens need extra calories during the winter to not only maintain their health, but also their egg laying ability. A freezing and starving chicken won’t give you many eggs, and they may even resort to eating the eggs if they are starved enough for calories. We double the flock’s food during the winter for a few reasons. First, with snow blowing into the run and covering the food up, they have a hard time finding the food. Second, we had no drop-off in egg production last year during the winter months, even without adding a light. And third, scratching around in the dirt is what chickens like to do, so with more food on the ground, they have more to do, stay more active, and are therefore healthier. Be sure to give them plenty of treats too, like cracked corn, mealworms, and birdseed. Corn contains can fatten up your birds and mealworms provide a huge shot of protein. Just be sure not to overfeed them on treats, and just add this as a supplement to their normal food. Ensuring that your chickens have clean, drinkable water is one of the foundations of owning animals. However, keeping that clean water drinkable when it is thirty below zero out can be a bit tricky. The easy solution to this is a heated water dish. Even in the coldest temperatures, these dishes keep from freezing over. There are a variety of styles available, and really, this is your best bet. However, this is not the only way. You can make your own heater through using a light bulb placed inside a cinder block or large tin, and then place the water dish on top of that. It’s a little more dangerous than the heated water dish, but if you like to have your water dish elevated anyway, this may be a good solution for you. If you’re one of those lucky people that lives in an area where it gets below freezing just once in a while, throw a few ping-pong balls in the water dish. Anytime there’s a breeze, the balls will move around preventing any ice from forming. And this will almost certainly not cause a fire. Chickens that have longer combs are more susceptible to frostbite than those with a shorter comb. Some breeds are extremely cold hardy while others are less-so. If any of your birds has a long comb, buy a big jar of petroleum jelly. When it gets to be super cold, rub a thick mat of jelly on the comb and waddles to help stave off frostbite. The jelly acts as a great insulator, but don’t be surprised if you see a stray feather or two stuck to the comb. Chickens are wonderful animals to have around, and for very little expense you can have them set up nicely for the winter. It doesn’t take much to keep them healthy and happy, even during a long winter. Just make sure that you take care in where you place heat lamps and water dishes, and provide them with plenty of food, so that they can continue to return the favor and keep your family in full supply of eggs and meat. Ever thought about what happens post SHTF? Here are the 15 essential skills you MUST have. There’s few things as bad as a warm beer or soda, especially after a long hike outdoors. Check out my recommendations for the best coolers on the market. Preserving food is one of those skills every prepper or hunter needs. Here’s how you can easily preserve eggs, meat and dairy.